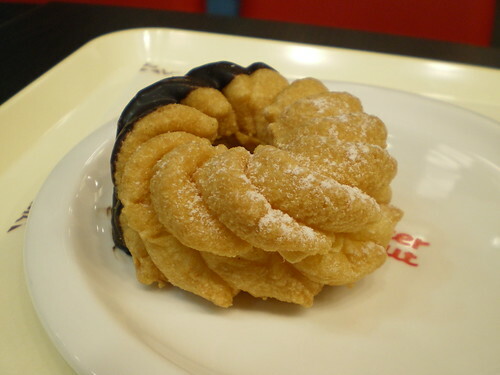 Until Friday it had been a long time since I had set foot in a Mister Donut. It used to be a favourite haunt of my friends and I in Yokohama, where we'd gorge ourselves on the bottomless coffee and scoff doughnuts as we put the world to rights and drew silly pictures on napkins. So I jumped at the chance on Friday when I arrived at the National Assembly station on Line 9 and discovered a Mister Donut right by the ticket gate. Tongs and tray in hand, I scoured the shelves for my favourite doughnut of old, and there it was... the Angel French Cruller. A delicious combination of chocolate, fake cream and deep fried dough based goodness. ah Mister Doughnut, what I cool place. My first memory of this place was when my hogwan transfered me to another school, forgot to pay me and then sent me to Japan to get my visa. After sleeping is a park, I scraped together enough coin to get a cup of coffee.